The long wait is over; ‘Small Town Lullabies’ is the 11th part of the series and it’s full of indie-folk songs from ten less known artists. If you are interested in gentle acoustic music with melancholic melodies, then don’t hesitate and download this sampler for free! 50 minutes under the gothic moonlight – Vol. 10 is a delayed halloween gift that brings back the feeling of old and forgotten horror movies. Ten different tracks (dark metal and gothic rock songs as well as atmospheric ambient and piano pieces) are waiting to be downloaded. 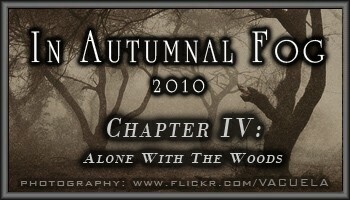 Follow us and sink deep into the autumn mist with the aid of this tripartite free mp3 sampler. Expect mighty Black/Pagan Metal (Chapter I & II) as well as atmospheric Folk and Ambient (Chapter II & III) and fall in sweet melancholy for over two and a half hour. Make the experience of a never ending autumn, not less than thirty bands and solo musicians are involved in this perfect soundtrack for a dark but also beautiful season. Including new and unheard metal songs from Imperium Dekadenz, SIG:AR:TYR, Oakenshield and Njiqahdda, accompanied with acoustic music from artists like Nest, Art Of Empathy, Vurgart, Novemthree or Message To Bears. Don’t miss this great chance and download this compilation (with full artwork) for free! Again, another moody soundtrack for a rainy night – ‚Alone with the rain‘ awaits all open minded listeners with a mix of various dark music genres. The eighth part of the series brings you a varied mix of catchy (but also deep and emotional) songs and atmospheric instrumental tracks. ‘Spirits of Summer’ is a soundtrack for sunny days, starlit nights and the life itself. So, If you like new wave, folk, post rock, indie pop, piano, ambient, shoegaze or simply good music you should definitely check this out! Experience the melancholic but also fulfilling mood, being far away from home. An endless longing for everything familiar, searching for the peace of mind on a trip through unknown worlds. Get in touch with Volume 7 of Skeksis86 free download sampler and feel free to reach landscapes far away from home with ten unknown groups from ambient, acoustic and post rock underground. More than fifty minutes of deep and minimalistic music, created to express the inner feelings, when you’re finding yourself. Melancholy and darkness – in the style of the first three releases. 45 minutes of acoustic guitar, apocalyptic folk songs and ambient. Heavy guitars and pounding beats await you on the 5th part. Over a half hour full of industrial rock similar to bands like Nine Inch Nails, Rammstein or Frontline Assembly. A compilation inspired by the blockbuster movie 2008. Modern Gothic Rock with the spirit of 80’s bands like The Sisters of Mercy or The Cure. Open a bottle of red wine and enjoy this underrated bands. The perfect music for melancholic moments during the early morning. 40 minutes of (mostly instrumental) acoustic pieces from unknown artists. A journey through the darkest nights. Over one hour of monotone black metal, dark ambient and more. A compilation full of melancholic folk songs and atmospheric metal anthems. The album contains 50 minutes free music for misty autumn days and walks in the twilight. If you like Empyrium, Agalloch or Dornenreich you will also like this.